What’s Next in CAR T-Cell Therapy? CAR T-cell therapy—a form of immunotherapy that uses genetically engineered T cells to intensify the immune system’s response to cancer—represents one of the biggest advances against cancer in recent years, producing early remissions in more than 80 percent of patients with B-cell acute lymphoblastic leukemia (ALL) and nearly half of patients with B-cell non-Hodgkin lymphoma (NHL). But, if researchers are right, these therapies’ potential has only begun to be exploited. “Research is under way to determine if CAR T-cell therapies can be made even more potent against cancers in which they’re already effective, if their effectiveness can be extended to other types of cancers, and if some of their side effects can be eased,” says Caron Jacobson, MD, medical director of the Immune Effector Cell Therapy Program at Dana-Farber. For patients with B-cell malignancies including Hodgkin lymphoma and most non-Hodgkin lymphomas, investigators have launched trials combining CAR T-cell therapy and immune checkpoint inhibitors, which release the brakes on a T cell attack on cancer. The combination is thought to be especially promising because it not only infuses patients with CAR T cells that target their cancer but gives the cells a green light to launch their attack. Researchers are also developing CAR T cells that can home in on two or three surface proteins on cancer cells, rather than just one, as is currently the case. The hope is that these next-generation CAR T cells will be better at recognizing and targeting cancer cells than current versions are. Also on the horizon for patients with B-cell malignancies, scientists are working on ways to make CAR T cells from T cells donated by healthy individuals, rather than the current approach, in which patients are treated with genetically modified versions of their own T cells. Such therapies, known as “off the shelf” CAR T cells, would increase the likelihood that T cells used in treatment are healthy and could lower the cost of CAR T-cell therapy and make it more readily available. But it also has some potential downsides: patients’ immune systems may quickly eliminate the foreign CAR T cells, or the CAR T cells could attack patients’ healthy tissue. Both issues will be examined as investigators study if this approach to CAR T-cell therapy is safe and effective. In devising CAR T-cell therapies for solid tumors, researchers face the challenge of identifying cancer-related proteins, called tumor antigens, on the surface of cancer cells that can be recognized by CAR T cells. As in B-cell malignancies, investigators are exploring whether CAR T cells that respond to two or three such antigens are more effective than those that respond to just one. Scientists are also at work improving CAR T cells’ ability to reach the interior of solid tumors, where they can be more effective. One approach is to construct CAR T cells that carry a receptor that draws them into the tiny network of veins and arteries that often wind through solid tumors. Yet another area of research seeks to make the tissue adjacent to tumors, which is often hostile to T cells, more hospitable to these cells. Another area of research seeks to determine if CAR T-cell therapy can be used earlier in a patient’s course of treatment. Currently, it is approved for patients who have received at least two prior therapies. Investigators are exploring whether it’s possible to identify patients who are unlikely to respond to further chemotherapy treatment and might benefit from CAR T-cell therapy after just one round of chemotherapy. 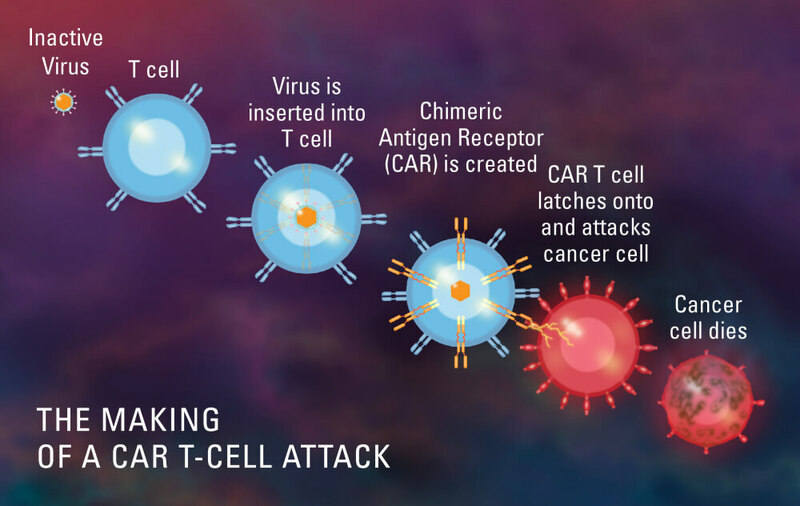 Learn more about CAR T-cell therapy from Dana-Farber Cancer Institute. Will t-cell therapy work for peritoneal carcinmotosis? Thank you for reaching out. As of May 2018, CAR T-cell therapy has been approved by the U.S. Food and Drug Administration as standard therapy for some adult patients with aggressive non-Hodgkin lymphoma that has relapsed after prior treatments, or has not responded to other therapies (refractory), and for patients age 25 and under with relapsed or refractory B-cell acute lymphoblastic leukemia.